These bedroom wardrobe designs feature a variety of different options for rooms that don’t have a closet or need additional storage. 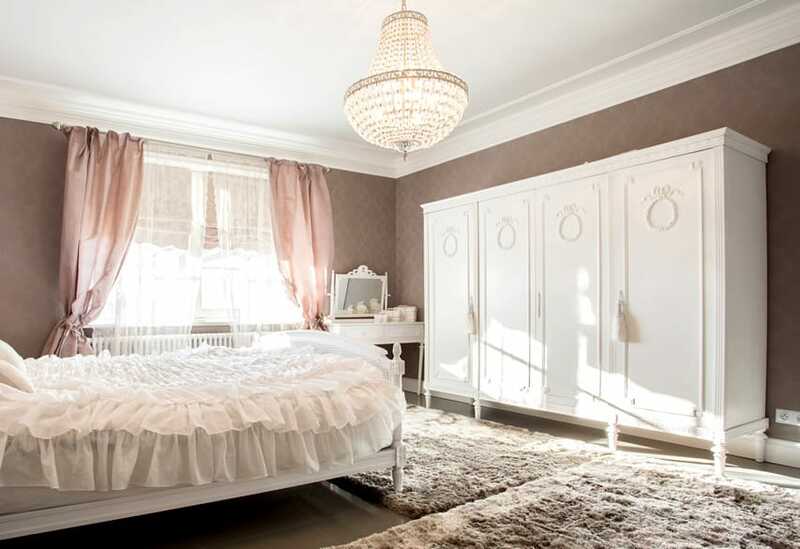 After your bed, your dresser or wardrobe is the biggest piece of furniture in your bedroom. How you choose a wardrobe for your bedroom will depend on the space you have, the storage you need and your own personal style. A wardrobe is basically a standing closet used for storing clothes. There are two basic types: freestanding and fitted wardrobe. The basic difference is a fitted wardrobe is often built into the wall and cannot be moved while a freestanding wardrobe is a standalone piece of furniture that can be moved. A freestanding wardrobe is a design that has been around for centuries. One of the classic names for a freestanding wardrobe is armoire; tall wooden cabinets with closed doors hiding shelves and drawers for storage. Today, wardrobes can also be made from cloth, plastic or even metal and come in different styles from elaborate and vintage to sleek and contemporary. 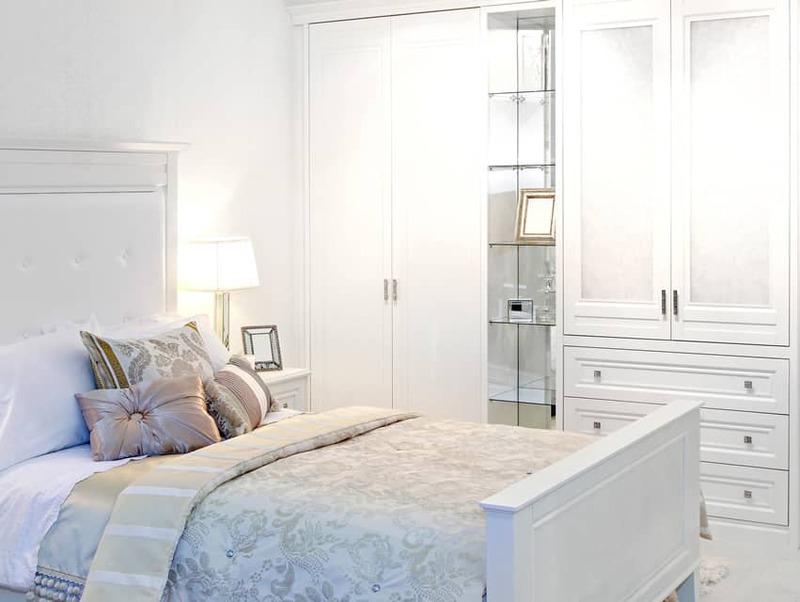 A fitted wardrobe is one built by a contractor to specifically fit into your bedroom. Because it is custom build, you can specify the storage options you want. However, one the fitted wardrobe is built, it is permanent so if you redecorate, you will either have to get a new wardrobe built or work with the wardrobes style. Before you decide on a wardrobe, make sure it fits. Not just in style but also in dimension. Measure the available room area to make sure the length and the height of the wardrobe can be accommodated while still making sure that you can fit other furnishings and move around. The wardrobe in this all white themed bedroom is the perfect place to hang clothing and is a great addition to a guest bedroom. The tall wardrobe design makes it a great choice for smaller bedrooms. 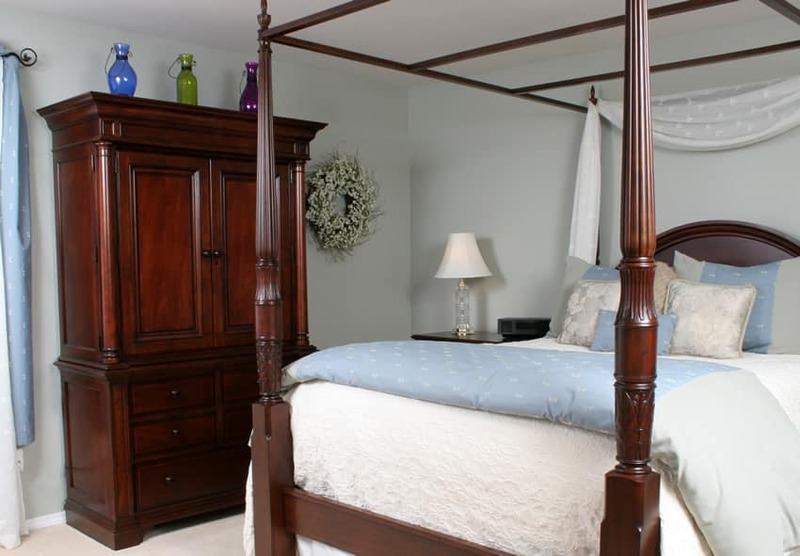 This traditional design solid wood armoire makes an impressive addition to a bedroom. The interior is made up of two different compartments with a rod for hanging clothing. Armoire’s are different from regular wardrobes as they tend to larger and are often more ornate in their design such as the one shown above. This ornate white armoire features intricate wood scroll work and plenty of capacity for clothing items. The designer bedroom is carefully matched with furniture pieces to match the wardrobe such as the unique bed frame and the upholstered ottoman bench. 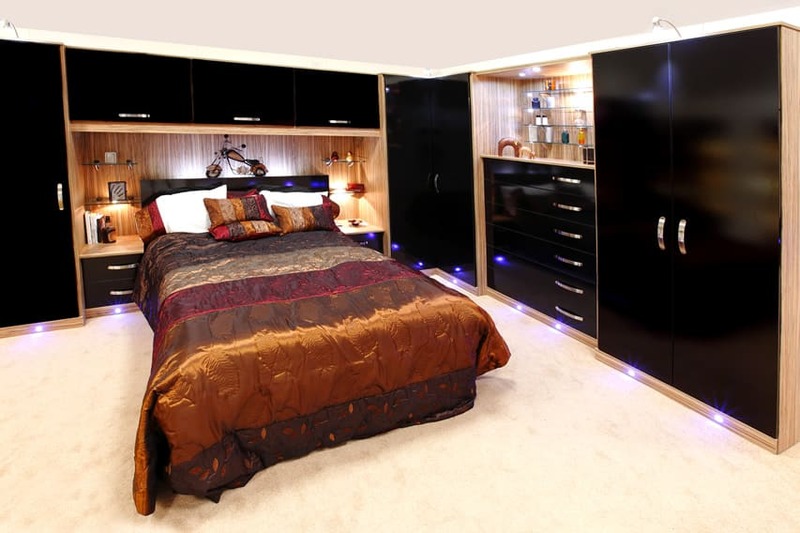 This is an example of a modern fitted bedroom with under cabinet lighting and chrome handle pulls. The cabinet is framed with a light wood color with a black lacquer face. Along with multiple wardrobes the cabinet offers glass shelving for personal accessories, as well as drawers for shirts and undergarments. A nice feature of this unit is the built-in night stand area to either side of the bed with room for additional storage. This type of armoire is commonly referred to as a chifforobe. A chifforobe is a versatile cabinet that combines a chest of drawers with a wardrobe in one unit. 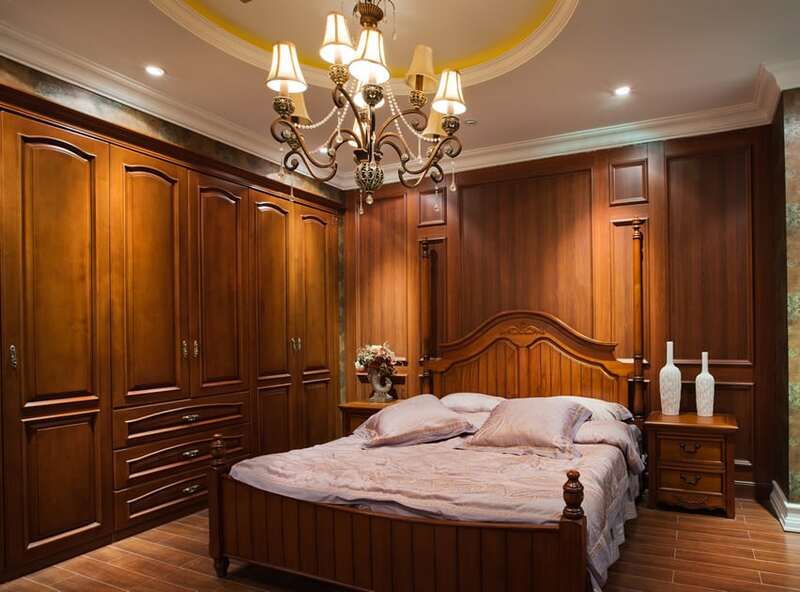 The stained cabinet of this one with the detailed woodwork makes it an attractive bedroom piece. This is an example of a wall wardrobe almirah which is basically a cabinet that is built in to the wall of a bedroom. This almirah offers a double wardrobe as well as a cabinet with glass shelving and built-in drawers. The cabinet is a flat white color with dull silver knobs and pulls. This type of wardrobe design is a great space saver and ideal for bedrooms without a designated closet space. 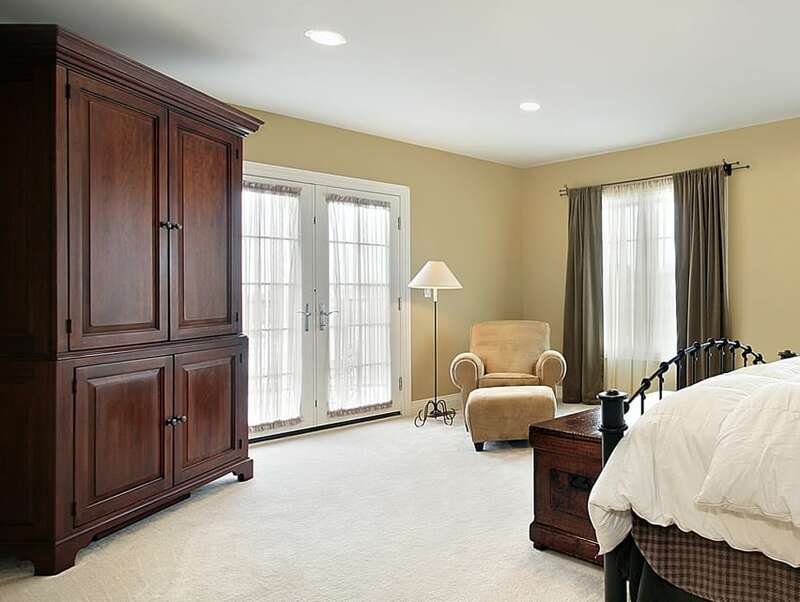 This gorgeous custom fitted bedroom offers multiple floor to ceiling wardrobes and shelving. The elegant style of the cabinetry in a chestnut brown color gives this room a regal and old world feel. 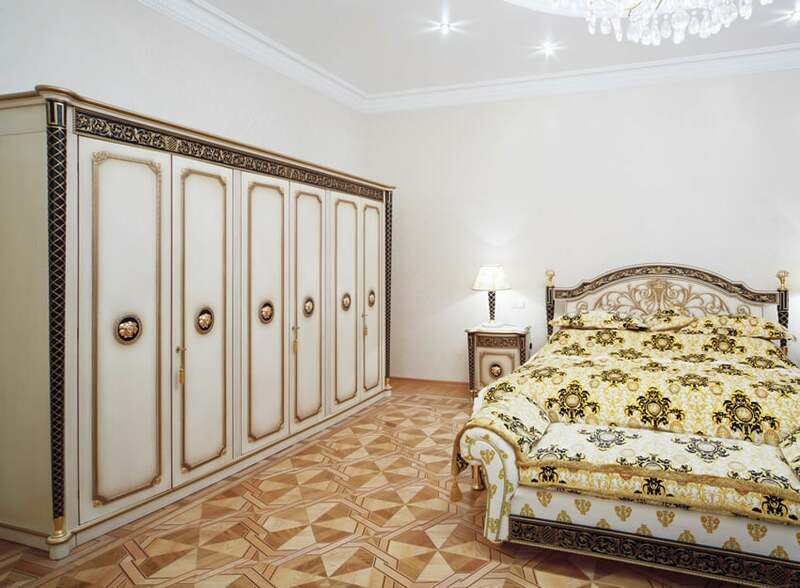 The wardrobe shown here is designed in the highboy fashion on legs with a tall cabinet. The decorative wood engraving compliments the other furniture pieces in the bedroom such as the small dresser, and the bed frame. White moldings and baseboards provide a nice contrast against the light brown textured wallpaper. 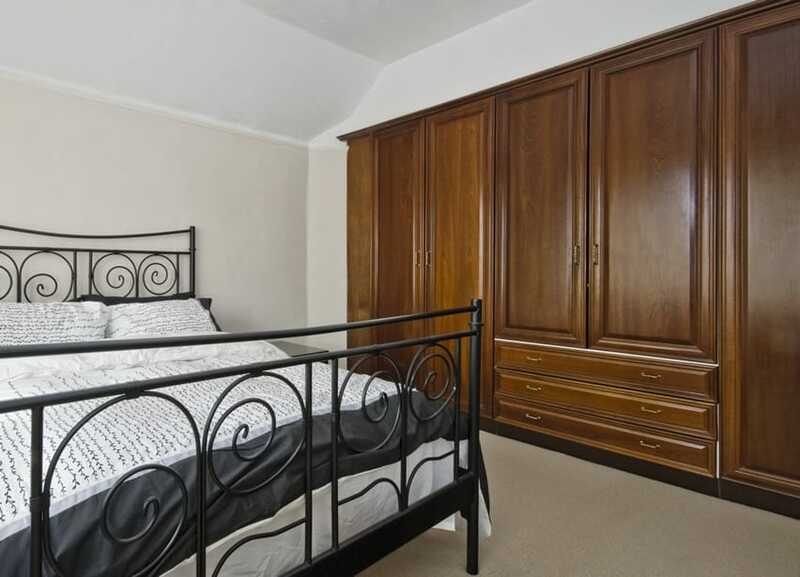 The stylish cherry wood wardrobe shown in this picture goes perfectly with the bedroom’s other furniture pieces. 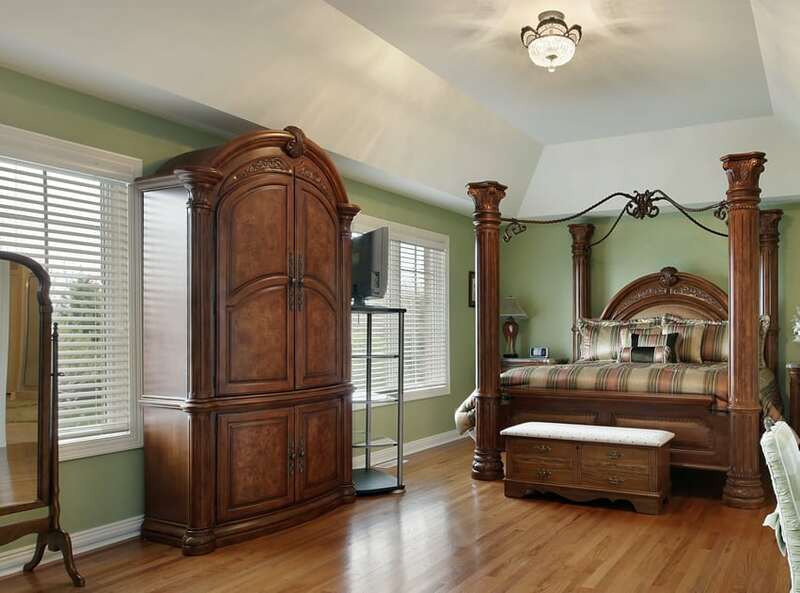 The curved bed frame and the end tables all have the same wood finish which gives this room a nice aesthetic. The built in backdrop of the wall above the bed provides a nice depth of space and elegance with its wood trimmed frame. This old world style wardrobe harkens back to a simpler time. 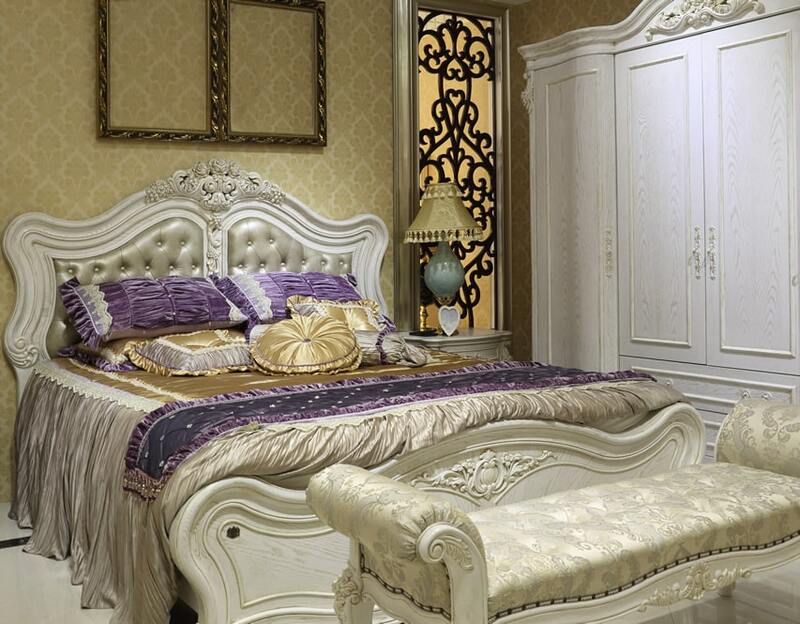 With gold inlay and intricate scroll work in the wood it makes a big impression on this bedroom. Matching night stands, and bed frame compliment each other and give the overall impression of romance. This massive wood stained armoire has several compartments for clothing as well as a chest of drawers and center section for hanging clothing. This type of wardrobe is perfect for period homes that may not have a lot of storage or closet space to offer. A large pine wood armoire with a chest of drawers and plenty of room for storage. 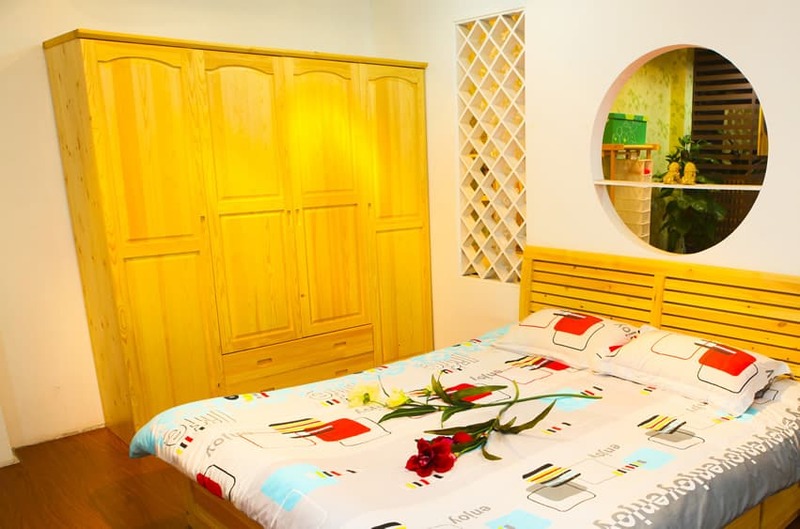 The room features a matching pine bed frame that presents a bright and cheery theme. This wardrobe features a distressed wood look with rustic design in white. 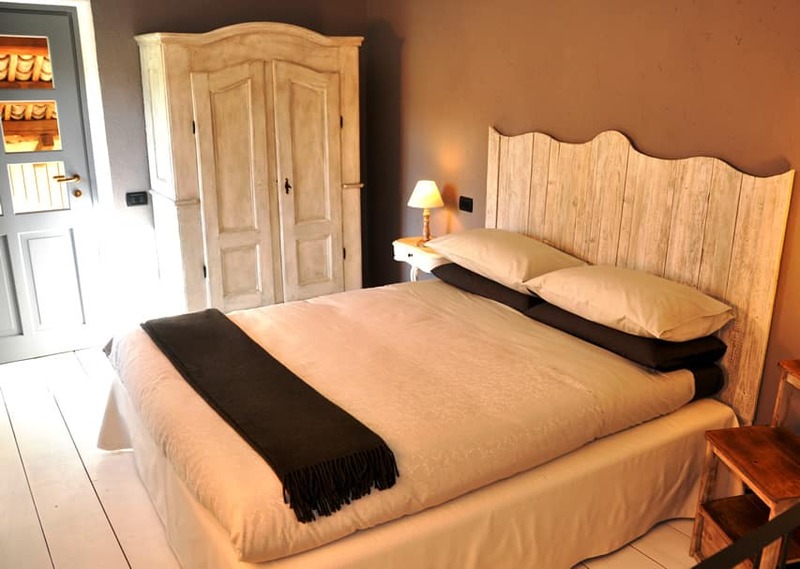 It matches the basic wood bed frame and goes together with the overall farmhouse theme. 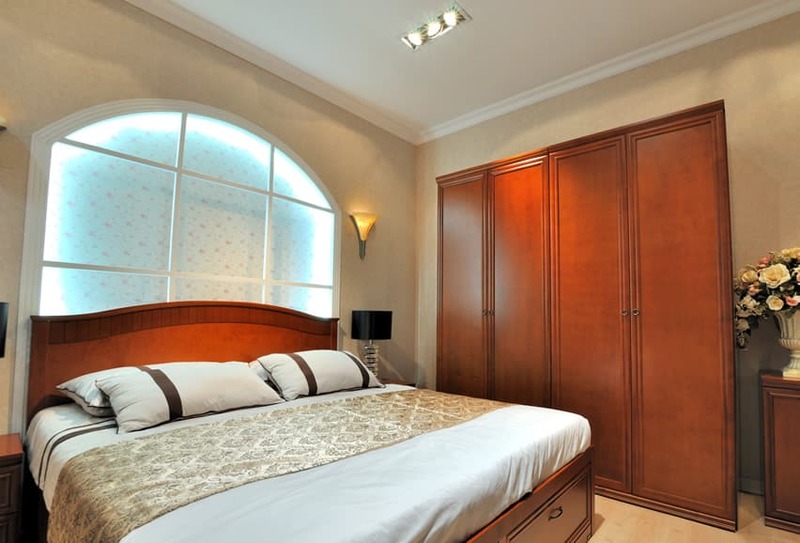 Bedroom wardrobe designs are often a necessity for older homes that don’t have a built-in closet. 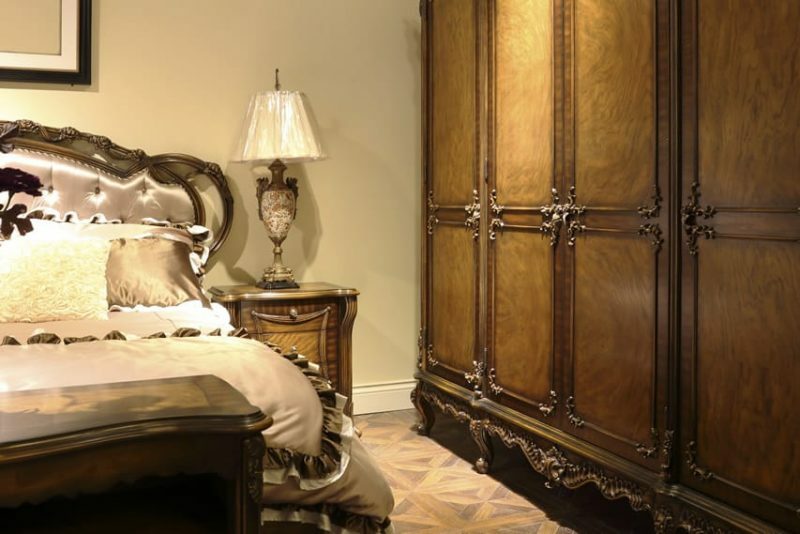 This grand wood armoire makes a beautiful corner furniture piece for this bedroom. It provides two compartments with room for hanging clothing in the upper level as well as a large storage area below. The piece is also complimented by a beautiful antique bed chest.